In an astonishing round that had to have Gashimov smiling, the final round saw three of his compatriots winning their final games. However, the biggest result was of course Mamedyarov who defeated Giri in a superb rook endgame he played to perfection, right after beating Caruana in the previous round. In a nail-biting playoff, he defeated Caruana and snatched the title. Coming in as the 6th seed in this tournament, Mamedyarov made it through the end, beating Fabiano Caruana and Anish Giri in the last two rounds, and beating Caruana further in the tie-break playoff games. The Vugar Gashimov Memorial, is being held in Shamkir, Azerbaijan, from the May 26 to June 4, 2016, in memory of the great Vugar Gashimov, who passed away on the 10th of January 2014. 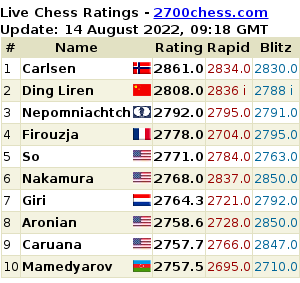 The tournament features ten world-class players: Fabiano Caruana (2795), Anish Giri (2790), Sergey Karjakin (2779), Pavel Eljanov (2750), Pentala Harikrishna (2763), Shakhriyar Mamedyarov (2750), Teimour Radjabov (2726), Eltaj Safarli (2664), Hou Yifan (2663) and Rauf Mamedov (2650). The time control is 120/40 moves + 60/20 moves + 15 minutes + 30 seconds/move at the 61st move.